A group of 11 Nobel Peace Prize laureates have asked President Putin to drop piracy charges against 30 people who were arrested after a Greenpeace Arctic oil rig protest. The president’s office said the plea should be directed to the judiciary. The Nobel Prize laureates, including South African Bishop Desmond Tutu, Northern Irish peace campaigner Betty Williams and Former President of Costa Rica, Oscar Arias Sanchez, voiced their concern over possible environmental damage that oil drilling may cause to Arctic in case a spill happens as well as the impact on climate that development of the region would cause. “We urge all states to do their utmost to protect this precious treasure of humanity, while moving beyond a dependency on oil as an energy source. As one of the countries most directly concerned, we call on you to personally lead that effort,” the letter said. President Putin’s spokesman said the authors of the letter were wrong if they think it’s up to the Russian President to lay charges against the Greenpeace activists. 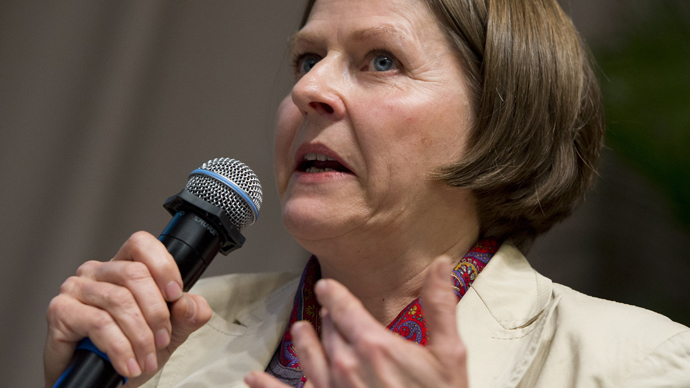 “The president has great respect for Nobel Prize laureates and always pays great attention to their opinions. 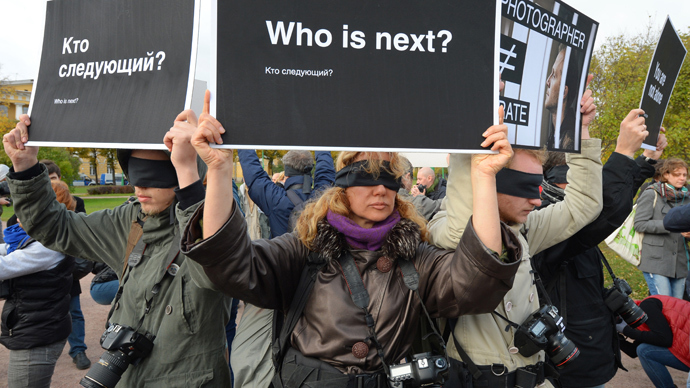 But in this situation the president is the wrong addressee,” Putin’s spokesman Dmitry Peskov told journalists. “It’s up to the prosecution, and everyone should wait for the investigation to end and for the court to pass its verdict. This is the law,” he added. Earlier on Wednesday the fate of the Greenpeace activists was raised during a telephone conversation between Putin and German Chancellor Angela Merkel. "The chancellor expressed her concern to Putin over the arrest of the crew of the Greenpeace boat, impounded in Russia, and voiced her hope that this case will soon be resolved,” her spokesman said. 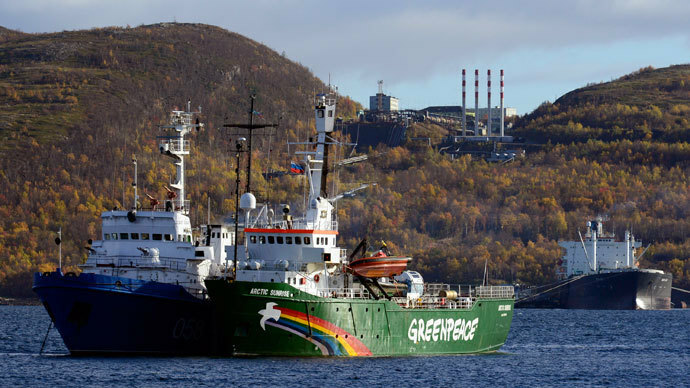 Russian authorities detained 30 people aboard a Greenpeace vessel, the Arctic Sunrise, which last month approached a Gazprom oil rig to stage a protest against Arctic drilling. A court in Murmansk, where the ship was transported, charged them with piracy, which can carry a punishment of up to 15 years in prison. Many people saw the gravity of charges as overreaction, criticizing Russia’s position in the situation. President Putin on his part said he was certain that the activists were no pirates, but said the protest posed a threat to the rig and could end with a spill – a worst-case scenario, which the action was meant to warn the world about in the first place. The court’s decision to remand the 30 people into custody rather than releasing them on bail also caused controversy. Greenpeace chief Kumi Naidoo offered to move to Russia and stay there for the duration of the investigation and trial as a guarantee that no activists would try to flee Russian justice. “Greenpeace never considers itself above the law. There are numerous cases where there have been peaceful actions and where there have been charges of trespassing and so on,” Naidoo told RT’s Oksana Boyko on the World Apart program. “And even when our activists had gone to their home countries, they always came back and faced those charges. Reasonable charges that are proportional to the actions that were taken are absolutely fine,” he added. Greenpeace has complained on several occasions about the conditions at the detention center where the arrestees are kept. It claimed the center’s rules make it difficult to deliver books not written in Russian for those held in custody to read. 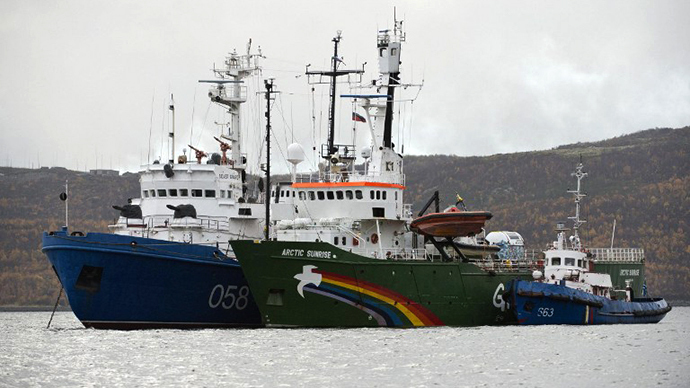 On Thursday, the Arctic Sunrise, which was also detained after the protest, was transferred from its mooring in the Kola Bay to a pier at Murmansk’s Commercial Sea Port. “The vessel’s vital activities are being ensured," Russia’s Federal Security Service said in a statement. The FSB statement came after warnings from Greenpeace that its ship could be damaged and is “at risk, including the risk of sinking” if it isn’t serviced properly.